Senior Likud ministers, including key Netanyahu allies, support Judea and Samaria leaders call for more building. Likud ministers and other senior officials are backing Samarian Regional Council head Yossi Dagan in his fight against the government after Dagan state that Netanyahu "was missing a historic opportunity" for not building in Judea and Samaria. Dagan had attacked Netanyahu after it became clear that out of the 3,829 units which are expected to receiving approval at next week’s Higher Planning Committee meeting, only 870 are slated to receive permits – the last step before the projects can be put on the market. 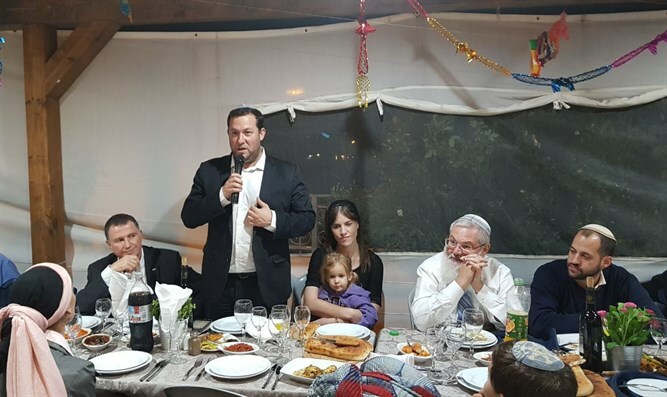 Minister of Transportation MK Yisrael Katz (Likud) spoke to Har Bracha residents at the inauguration of a new neighborhood on Tuesday. "I want to tell you that Yossi Dagan is battling at the front," said Katz. "We need to build as much as possible in Judea and Samaria, as many bypass roads and industrial zones as possible. I'm with you." Welfare Minister MK Haim Katz (Likud) also issued a statement on the subject, saying that "Yossi Dagan and the Judea and Samaria Council heads are the natural partners of a right-wing government"
Knesset Speaker Yuli Edelstein concurred. In a toast with Samarian village heads, Edelstein slammed the government's propensity for not following through on building in Judea and Samaria. "We are told to wait for the proper timing. For some reason, the timing is never right," he said sarcastically. "We make promises but the promises need to wait for the right time, which never comes...we want construction in the Land of Israel and in Samaria in particular." Deputy Minister of Defense MK Eli Ben Dahan (Jewish Home) noted the importance of building bypass roads, which were left out of the expected building approvals. "The land of Israel is ours, it does not belong to any other nation," he declared. A number of Judea and Samaria Council heads also sent out statements supporting Dagan, including the head of the Gush Etzion Regional Council and the head of Bet Aryeh. Dagan himself weighed in on the controversy, calling his statements "unfortunate, but this is a war of no choice. The leaders of the Judea and Samaria Council were hoping for a wave of construction following an almost total freeze on building during the Obama administration and are bitterly disappointed over the low number of housing units that the government is building. Senior government sources have defended the amount of building, telling Arutz Sheva on both Tuesday on Wednesday that the government was building far rapidly than during the Obama years. "The government will approve 12 thousand housing units in various stages of planning and construction - four times the amount that was approved in 2016. Whoever claims that this is not a significant improvement is misleading the public," the source said.